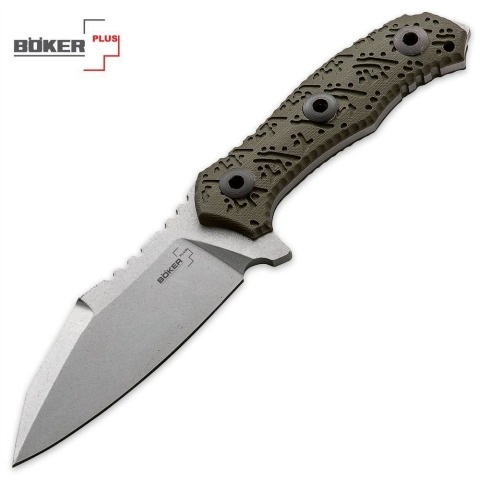 This Boker model Colubris comes equipped for the survivor man. It is made from 440C and G-10 to survive the harsh environment that will be encountered in a survival situation. Add to that, the Colubris has incorporated a unique, modified Wharmcliff style blade for a variety of uses. 440C stainless steel is a very durable grade of stainless steel that provides the user with very good wear resistance and good corrosion resistance in an outdoor environment. The 440C is hardened to RC 58-59 to provide a keen cutting edge and high strength to this blade. The Wharmcliff style blade has been modified with a secondary edge and smooth sure grip jimping on the back of the blade. The 8 7/8” long blade provides a long 4 ¼” cutting edge and a full tang hammer end for those survival uses. The G-10 material is used to fabricate the handle scales. G-10 is an impermeable composite that can withstand a harsh environment. The olive green G-10 scales have been fabricated with ridges to provide a sure grip to the user. When you place one of these Colubris knives in your hand, it feels like an extension of yourself. It is a great knife for whittling, chopping and slicing and is a very valuable combination of materials and workmanship to have with you in a survival situation.